From the start of the year, it looked like Weber State and Montana were the two best teams in the Big Sky. On Saturday, they will meet for Round 1 this year (Round 2 to follow, and I have a sneaking suspicion Round 3 will follow after that). The circumstances around the game make it the Big Sky game of the year so far, as both teams are undefeated in the Big Sky (everyone else has at least 2 losses. Weber State improved to 5-0 in the conference after a 63-49 slugfest over Montana State. 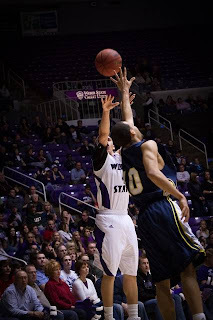 The game was tied at the half, but Weber exerted their will in the second half, outscoring the Bobcats 36-22. Damian Lillard was solid with 17 points and 6 rebounds (though he struggled from the field), but it was Scott Bamforth who led the way with 20 points. It was the Wildcats seventh straight victory. Kyle Bullinger played as well, his first action since December 3. He was scoreless in 10 minutes, but it had to be a great boost for them to get him back playing. There was hope that Frank Otis would be able to play as well, but he did not get in the game. For the Bobcats, they simply didn't get anything going offensively. They shot 34% from the floor, and only got to the line 6 times (and made 2 of them). They had a great defensive effort, but leading scorer Xavier Blount was 1/8. When he struggles like that offensively, they simply do not have the firepower to beat the top tier of teams in the Big Sky. For Montana, there were no struggles on Thursday night. They jumped out to a big lead over Northern Arizona, and they never relinquished it. They made 13 of their first 19 shots, and were up by 16 at the break. The second half was more of the same, as the Grizzlies simply overwhelmed the Lumberjacks in all facets of the game. Montana shot 59% from the field, while NAU was held to 31%. Montana got the bench involved early, which got the freshmen some good playing time. The more minutes that Keron DeShields, Kevin Henderson, and Jordan Gregory get, the better for the long-term future of the program, so games like this are very nice for Montana. It is my opinion that one-bid leagues are better off with 2-3 teams clearly above the rest of the conference, and right now that is what seems to be settling out with Weber State and Montana right now. Nationally, it is tough to get people to pay attention to a low major unless there is a good race, so hopefully these teams can remain strong and neck and neck throughout the year. So far, so good. How can I watch this game Saturday night? Think it comes down to Will Cherry-Kareem Jamar vs Damian Lillard? And I think it might come down to Scott Bamforth for Weber State... Lillard is good enough that he is going to get his (though Cherry is a great guy to try and slow him down), but the Wildcats need Bamforth to be a strong contributor as well. Weber is 5-0 for the first time since 2003 when they went 16-0!!!!!!!! !